Carving pumpkins and displaying them outside is as integral to Halloween decorating as is setting up scarecrows, witches, and ghosts. But the project is not without its pitfalls. 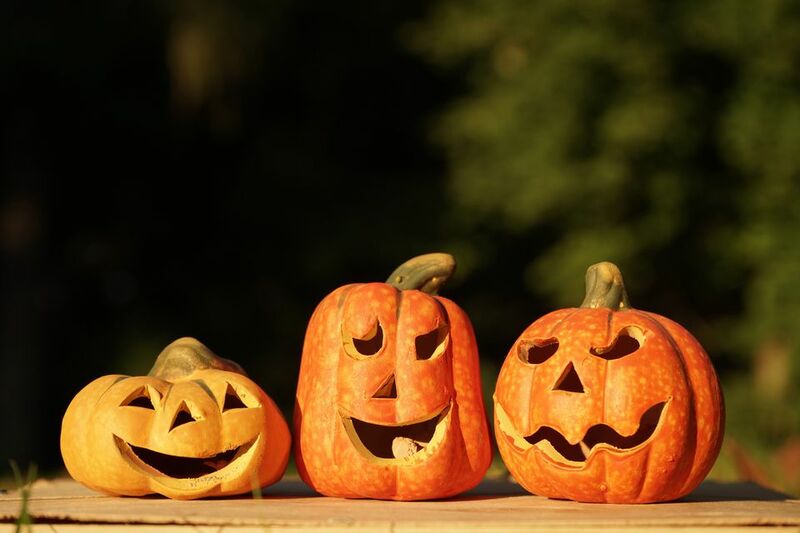 While you should definitely pursue the time-honored practice of making your own jack-o'-lanterns in fall, it is best to learn some safety tips first to ensure both a happy and healthy Halloween for all. Carving jack-o'-lanterns is a messy business, so work outside. Set up a temporary workbench (for example, lay an old door or planks across sawhorses or cinder blocks), preferably on the lawn. Why the lawn, rather than the driveway? Because the pulp from jack-o'-lanterns (which you'll need to scoop out) is slippery. If you get some on the driveway, someone could slip on it and get hurt. Secondly, carving jack-o'-lanterns involves the use of cutting tools, such as knives. Wear heavy gloves so that, in the event that the cutting tool slips, your skin is at least partially protected. Also, when the jack-o'-lantern is completed, don't leave knives lying around outside. Kids might come along and pick them up. When our jack-o'-lanterns are ready for display, we often set them out on decks, patios, or porches. In so doing, we may be unwittingly inviting rodents and stinging insects to the home, as these pests are drawn to the now exposed soft inner flesh of the jack-o'-lanterns. Of the two, the insects are the more dangerous if you're allergic to hornet or yellow jacket stings. To counteract the threat, set out insect traps. As carved pumpkins begin to rot (they can do so quite rapidly), the issue of their slipperiness again becomes a cause for concern. The problem is now exacerbated by the proximity of the carved pumpkins to doors leading inside from decks, patios, or porches. One morning, without watching where you're going, you could open the door, begin to descend the porch stairs, step on a piece of rotted jack-o'-lantern flesh, and take a nasty spill. Worse yet, a stranger could take a similar spill on your porch and sue you. So check your carved pumpkin daily for signs of rot. When it begins to feel slippery, don't take chances: Throw it in the compost bin. Alternatively, instead of sculpting pumpkins to make jack-o'-lanterns, create Halloween jack-o'-lanterns from hardshell gourds. Unlike pumpkins, they don't rot (they're permanent). Be thorough in your leaf removal efforts, so there'll be less flammable material around to catch fire. Don't leave them on your deck, patio, or porch during trick-or-treating hours, as kids' costumes may be flammable. A safer option for illuminating jack-o'-lanterns is to use glow sticks, which can be bought at party supply stores. With glow sticks, there are no flame, cord, or batteries to worry about, and they're waterproof. To activate them, bend them to break the internal glass capsule. Before cutting, draw out the line where you'll be cutting the lid off the top of the jack-o'-lantern, around the stem, so that you get an accurate cut. Use a yellow marker (so stray marks won't show). The lid-hole should be big enough to provide access for removing the pulp from the inside. While a circular lid is all right, a hexagonal lid is easier to put back on (you just line up the points). To cut the lid out, hold your kitchen knife at a 45-degree angle. That way, the lid will fit in like a keystone. Otherwise, as the jack-o'-lantern begins to dry out and lose mass, the lid is more prone to fall through the hole. Proceed to cut out the lid and remove it. With a garden trowel and spoon, scrape the pulp from the inner walls, removing all of the seeds and stringy orange goop. Now it's time to work on the jack-o'-lantern face. As with the cut for the lid, draw outlines on the pumpkin first, to serve as guides. If you don't trust your own ability to draw a design on your pumpkin, use a jack-o-lantern pattern. Since the cutting here is more delicate, begin by making cuts with a precision knife, then perforate your outlines with a flat-head screwdriver. Carefully insert a kitchen knife into the perforations to cut out eyes, nose, and mouth. Don't attempt to "saw," just use a series of jabs. Immediately after finishing your carved pumpkin masterpiece, apply petroleum jelly to the interior and to the cuts. Petroleum jelly will slow drying, thereby slowing deterioration. What Should You Look for in a Tree Service? Do Peonies Really Grow on Trees?